In the late 1950s, collectors of baseball cards began to realize that the number of living players featured on the most famous and perhaps greatest baseball card set of all time was dwindling. As a result, some enterprising collectors of T206 cards began mailing their cards to the last living members of the famed set in the hopes of obtaining a signature. Others tracked down aged ballplayers on visits to places like Cooperstown, New York, where stars of baseball’s past have been congregating since the 1930s. Since tobacco cards are relatively short and narrow, autograph collectors had not intuitively sought signatures on these cards, typically preferring instead to have larger index cards, album pages or photographs signed. Moreover, baseball card-collecting purists, who often consider a signature on a card as a kind of defacement, shied away from getting signatures on tobacco cards. Nonetheless, a small number of enterprising T206 collectors saw the player’s signature as enhancing the overall beauty and value of the card. 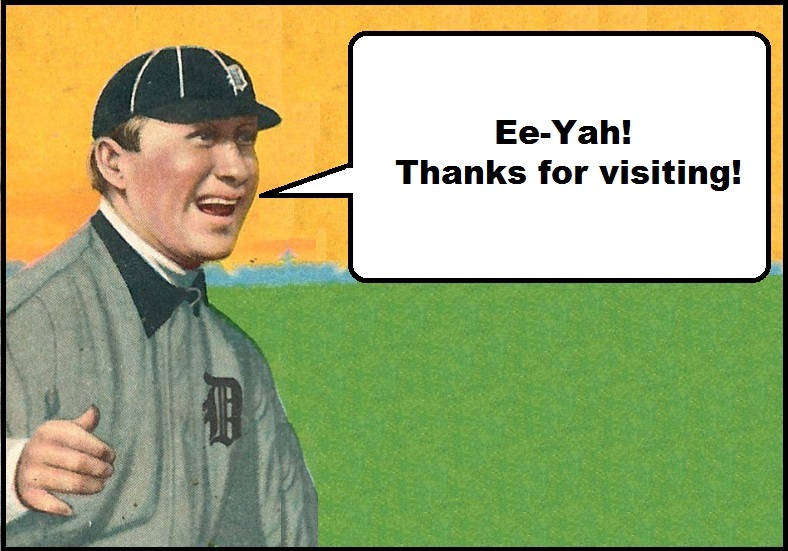 And most of the old timer ballplayers were quite responsive to the relatively unusual request to sign a T206 card. Among those who regularly drew their names across T206 cards were two former New York Giants – Hall of Fame pitcher Rube Marquard and centerfielder Fred Snodgrass. When returning signed cards to collectors, both men often advertised a book that they were featured in called The Glory of Their Times, by Lawrence Ritter. Inspired by the death of Ty Cobb in 1961 as well as the death of his own father at about the same time, Ritter, a professor of finance at NYU, set out on a self-described “strange crusade, searching the highways and byways of America for old ballplayers.” Over the course of six years, Ritter recorded interviews with numerous baseball players from the dawn of the 20th century, many of whom appeared on T206 cards between 1909 and 1911. In making these recordings, Ritter recognized that little, if anything, had been done to preserve the legacies of pre-war baseball players. Since the advent of radio and television, the sights and sounds of baseball have been and, of course, continue to be preserved. But aside from Ritter’s efforts, the pre-war player largely had not been captured by modern recording techniques. In 1966, Ritter transformed his tape recordings of the players’ voices into a book that many baseball fans cherish. This “story of the early days of baseball told by the men who played it” more recently came to life by way of an audio book version which now allows the listener to hear the actual voices of the men telling the stories Ritter printed. It is nothing short of amazing to be able to listen to one-time New York Giants centerfielder Fred Snodgrass defend his dropping of a fly ball during the 1912 World Series, a play that some consider to have lost the Series for the Giants. Since both Snodgrass and Marquard received royalties for their appearances in Ritter’s book, each player had a financial incentive to advertise the book in letters they returned with autographed T206 cards. In their letters Marquard and Snograss often included references to having autographed the "cigarette photo" cards that were sent to their attention. Sometimes they would enclose a promotional card for Ritter’s book, hoping the collector would purchase a book for himself. One of the most well-preserved evidence of through the mail T206 card autograph requests is captured below in an exchange between Fred Snodgrass and legendary collector John Wagner. This beautiful collection, including mailing envelope, signed letter, autographed baseball card, and action photo, has been mantained in tact for over 50 years. In addition to Marquard and Snodgrass, many other players signed T206 cards, often by mail, including Hall of Famers Ty Cobb, Cy Young, Walter Johnson, Fred Clarke, Nap Lajoie, Frank Baker, Frank Chance, Roger Bresnahan, Elmer Flick, Zach Wheat and Sam Crawford, who always seemed to add his nickname -- and Nebraska home town -- “Wahoo” to his signature. Even the widows of John McGraw and Christy Mathewson signed their husbands' T206 cards on their behalf. Not surprisingly, some of the player signatures most often seen on T206 cards are of those players who lived the longest. As such, the last two T206 survivors, Paddy Livingston, who died in 1977, and Marquard, who died in 1980, both signed numerous T206 cards in their lifetimes. Some of the players who signed T206 cards signed the front of the card, some signed the back, and some even signed both front and back. Sometimes “Chief” Meyers signed with his nickname, sometimes just his first name, John, and sometimes he printed his name and the year. Tommy Leach sometimes spelled his first name with a “Y” -- other times an “IE”. Davy Jones politely signed his name after, “Yours Truly.” In fact, all eight T206 ballplayers featured in Ritter’s book signed T206 cards. The lithographic representation of photographs makes the T206 set a colorful illustration of players from a bygone era. However, as with all cards and still photographs, they are but a static representation of a living person. Aside from a few short minutes of silent film clippings, very little captures the moving sights and sounds of the T206 ballplayer. Because of the elusive nature of trying to establish a link with these players, T206 cards acquire a special vitality when they capture a player’s signature on his card – more so than signed baseball cards from even as early as the 1930s, when recording of the game of baseball became more commonplace. Much like Ritter’s book and audiotapes, a signed T206 card brings the holder back in time, not only to when the player took the field, but also to when he held that card and signed his name, giving the card that incomparable personal touch. Signed T206 cards were no doubt marveled at by the original recipients and will be enjoyed thoroughly by autograph seekers, card collectors and baseball enthusiasts for generations to come.